Why is the life and world of the visual artist such an appealing subject for novelists? Perhaps I’m overstating it, but I’ve seen or read several in the last year (Jonathan Gibbs’s Randall, Niven Govinden’s All the Days and Nights, Han Kang’s The Vegetarian) and have strong memories of others: Patrick McGrath’s Port Mungo, Patrick White’s The Vivisector. Could it be that writers like telling painters’ stories because it enables them to write about the creative process – so familiar to them – but in a slightly, well, sexier form? The Ecliptic is such a book and more. Its narrator is an artist, and in the second part of the book we get a full-blooded account of her development as a painter, but there is more to it than that. We are told this only after we already know that she – Elspeth Conroy – is blocked, can no longer paint, and has come to Portmantle, an artists’ retreat on Heybeliada off the coast of Turkey, to rediscover her muse. Do you know how many plays I’ve written in my life? Thirty-six. Know how many of those were actually any good? One. One! If I had a market stall, I’d be in penury by now. This perfectionism could be the root of their problem, or a corollary of it. “The making part is what we’re addicted to, the struggle, the day-to-day,” Fullerton observes. Or, when Pettifer complains that “I’m useless in every respect, but especially in the field of architecture”, it could be a version of Thomas Mann’s observation that a writer is someone for whom writing is more difficult than it is for anyone else. But the clever thing is that the rest of the book makes such struggles feel vital and important, not silly and trivial, through immersing us in Elspeth’s past. After a dramatic conclusion to the first part of the book (“One of Four”, it says here: geddit? ), we get that entirely engaging and in-depth portrait of her birth and growth as a painter. She leaves her Scots upbringing and moves to London, where she has an informal apprenticeship with artist Jim Culvert, has early success, tussles (and more) with a critic, becomes sufficiently important through one series of work to be hung in the Tate, and then – stops. It is the ecliptic of the title that stops Elspeth, when she agrees to a commission to paint a mural for a new observatory, and cannot determine how best to depict the mysterious – well, what is it exactly? ecliptic, n. a great circle on the celestial sphere representing the sun’s apparent path among the stars during the year. All this is tremendous stuff, engaging, persuasive and full of life. And at its end it brings us back to when Elspeth – Knell – joined Portmantle, and so we skip back to the ‘now’ of the story. Here the book adopts a third form, after the Secret History-esque buddy drama of part one, and the life-in-full of part two. It turns into a mystery, which I can’t say much about to avoid spoiling it. It might be enough to say that it reminded me obscurely of Theodore Roszak’s underrated novel Flicker, which was a sort of mad conspiracy theory thriller about cinema. 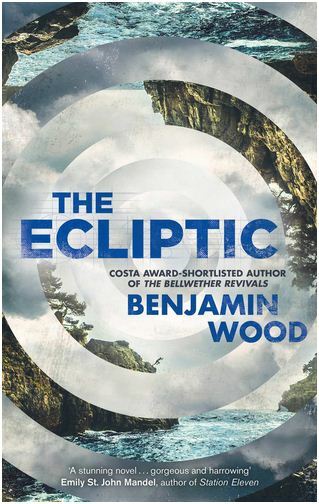 In The Ecliptic there is just as much eyebrow-raising implausibility, but the pages turn so smoothly – I rattled through its 465 pages in a couple of (bank holi)days – that quibbles flee. Indeed, its craziness is much of its appeal. If there’s a weakness, it’s in the revelation that comes near the end, which makes things too rational (but at the same time, paradoxically, explains both the neatness and the implausibilities earlier). In particular it seems a stretch to compare The Ecliptic, as my proof copy does, with the work of Kazuo Ishiguro, for its “delight in playing with our perceptions”. It certainly has a wide range and an impressive capacity for turning things upside down, but there isn’t really that sense of existential rudderlessness that Ishiguro excels in. Then again, to say that a book fails to live up to one of the greatest writers of fiction in English is hardly a knock. Another comparison the blurb makes, to David Mitchell, is closer to the mark. All in all The Ecliptic is a satisfying, irresistible novel with that combination of storytelling punch and literary sensibility which can, with luck, be the sign of a big commercial and critical success. I was going to say that it marks Wood out as a writer to watch, but that usually seems to me to be code for “this book isn’t all that good, but the next one might be.” Better instead to say that he’s a writer to read. Loved it too and raced through it ….a little bit Magus I thought ??? Oh I haven’t read The Magus…! A bit creaky, but well worth your time. I was already sold by your review, but anything that can be described as ‘a bit Magus’ is a winner for me. It’s a fabulous book! This is a brilliant review! I really enjoyed this novel, much better than Bellwether Revivals I thought. Thanks! I haven’t read The Bellwether Revivals, but I spoke to someone who had and also thought The Ecliptic was a significant advance on it. I agree with pretty much everything here, although I thought the book sagged a little in the central sections. A great review, as ever. Yea just read it, that nice. Heybeliada is a real place in the inland Sea of Marmara, not “off the Turkish coast”. It is home to a large Turkish naval academy and is the least cosmopolitan of a group of islands known as the “Prince’s Islands”. The idea of there being an artists’ colony there is unlikely, and of there being one with not a single Turk present is absurd – especially in the mid-1970s when the Turkish military was particularly sensitive to any unsettling foreign influences. “Portmantle” is, incidentally, totally unpronouncable in Turkish. Thanks Tim. “Off the Turkish coast” is my formulation (thanks for the correction) so that’s not Wood’s fault. In an interview here he talks about how he decided to set part of the book on Heybeliada: almost at random really, and in my view it could have been set anywhere. I don’t think the matter calls for plausibility – in fact, as I hint above, the book is not necessarily a reliable telling of the narrator’s story. This sounds a sort of highish-brow thriller, is that totally unfair? I’m getting a literary but accessible vibe, which I admit isn’t my favourite territory (I’m a snob, I prefer literary and inaccessible). Neatness troubles me as a word when used in a review. David Mitchell also fills the sort of territory I’m describing, so perhaps that is where we are. Interesting, but I suspect a bit in-between for me, neither pure entertainment nor genuinely challenging. I’d put it higher than a highish-brow thriller, Max, or perhaps to one side, as it’s a little odder than that – hence my comparison with Roszak’s Flicker. Hi, John, I really enjoy reading your blog! No, any chair or bed will do. Just stop – most of my reading is in such short bursts (kids, work, social media distraction) that I can’t afford to have a minimum session! No, it means I can’t concentrate. So if the TV is on I need to go to another room to read. Only ever one. I can’t conceive of reading more than one at a time. My completist impulse, I think. Anywhere, though there are few opportunities at work and I don’t often get out of the house on my own otherwise! Only ever in my head! Absolutely not – the very idea! Though I do abandon with impunity – I abandon more books than I finish – which is skipping ahead of a sort, I suppose. Like new. Most of my shelves contain only unread books (I don’t have room to shelve my read books, which are in the loft) but even those I’ve read look unread. Only a pencil line in the margin of a notable passage – in preparation for reviewing. Thanks, John! Always enjoy your reading your thoughtful blog.